Those that know me, will know I’ve been struggling to learn the guitar over the last few months. Recently my teacher, (the extremely talented Mr John Robson,) gave me some tab to learn, and helpfully recorded a backing track. Now it’s only 8 bars long, and not particularly fast, but I was still struggling to keep up. 🙁 Like all practical skills I learn by good old EDIP, (Explanation Demonstration Imitation Practice). However I don’t multitask well, Mmm thats not strictly true, I don’t multi-problem well! In an effort to break the problem down into smaller problems I wanted to just play one problem at a time! This needed me to play and loop a section at a time, to at least give me a chance! 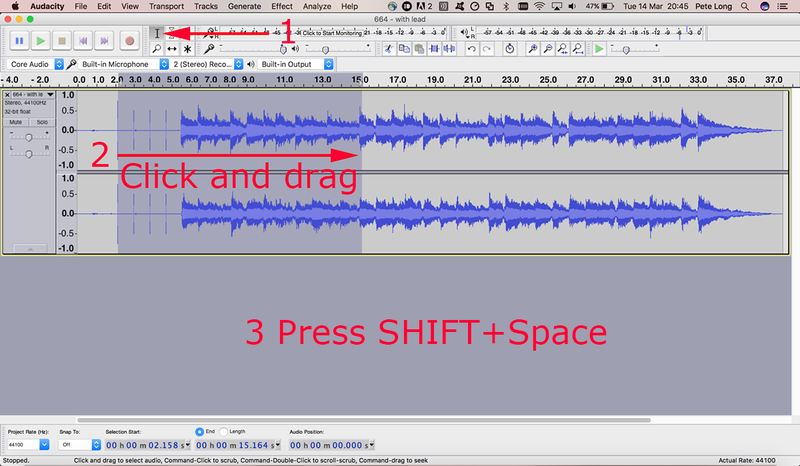 Open you audio track in Audacity and ensure you have the right selection tool chosen (1). Click and drag within the track (2), (not on the top of the track or it will annoyingly autostart playing from where you clicked). Finally, press and hold shift, and press the space bar. 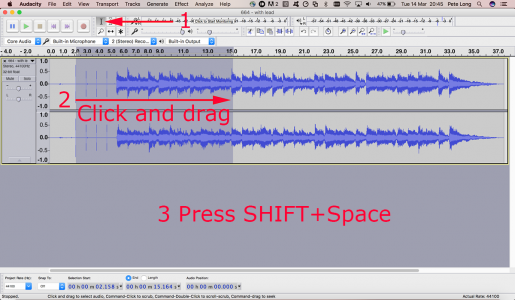 (I read some posts that said shift and click also works but it does not on my mac).